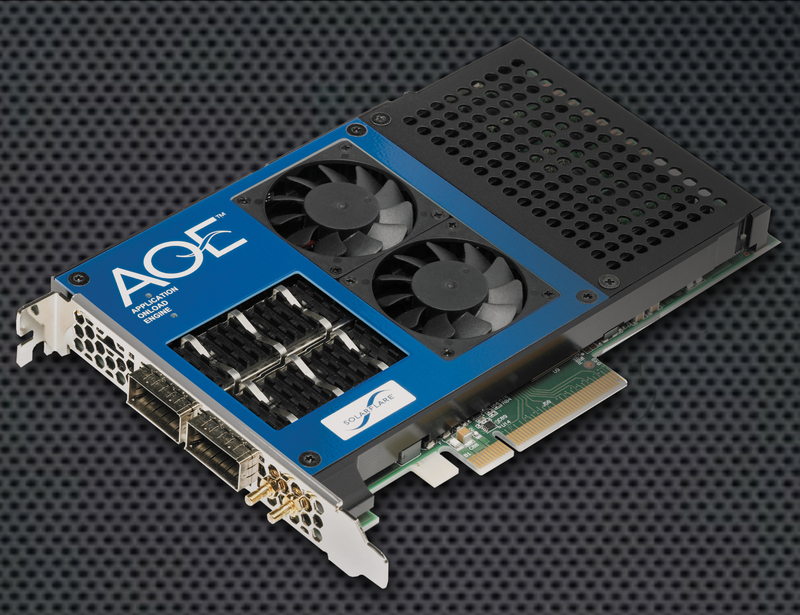 IRVINE, CA--(Marketwired - October 13, 2015) - Solarflare, the leader in application-intelligent networking software and hardware, today announced the availability of the SFA7942Q ApplicationOnload™ Engine (AOE) -- the industry's only FPGA-integrated 40Gb Ethernet server adapter that delivers best-in-class application performance and unrivaled architectural flexibility. Solarflare's AOE provides users with several unique advantages. First, with an open platform for 'on-the-fly' processing of network data, the architecture enables users to accelerate applications by migrating portions of their business logic into hardware. Next, AOE allows the network interface to be augmented with new features, such as monitoring and security. Finally, Solarflare's patented AOE nanosecond TCP stack (ANTS) enables TCP-based applications to be implemented entirely on the FPGA. This unique technology works in conjunction with the industry standard OpenOnload middleware and delivers robust, compliant TCP processing with extremely low latency, which scales to large numbers of TCP connections. ANTS consumes much less of the FPGA's logic and memory resources than alternative solutions, eliminating the need for costly TCP Offload Engines. The new Solarflare AOE offers an open FPGA platform that supports applications developed by customers, partners and third-party developers. Solarflare's comprehensive development environment -- the next-generation AOE Firmware Development Kit (FDK) -- includes everything needed to develop applications quickly, including: Access to board services cores; source code for the control plane; pre-configured PMA blocks and memory controllers; performant drivers for multiple operating systems; socket-based communication with host applications; an Avalon-MM™ compliant control bus; worked examples and full documentation. "Solarflare's second-generation AOE is a worthy successor to the previous iteration and is the cornerstone of our enterprise market data platform," said Michael Dunne, Chief Technology Officer & Co-Founder, ACTIV Financial. "The host of new technologies -- including 40GbE, a larger FPGA and the doubling of memory bandwidth -- will result in a 5X compute increase per rack unit. 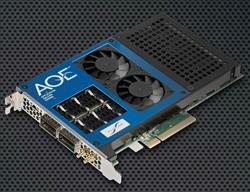 AOE is an essential tool for combating both server sprawl and high latency concerns." "Many of our customers are building network-intensive applications that require extreme low latency. While microprocessors are continuing to expand processing power with a multi-core approach, there is still no other technology available to address their performance obstacles," said Russell Stern, CEO of Solarflare. "By combining Solarflare's industry-leading server I/O adapter and the latest FPGA technology, our users are empowered with custom compute capabilities that enable them to break these performance barriers." Solarflare is the leading provider of application-intelligent networking I/O software and hardware that accelerate, monitor and secure network data. With over 1,400 customers worldwide, the company's solutions are widely used in scale-out server environments such as electronic trading, content delivery, high performance computing, cloud, virtualization and big data. Solarflare's products are available from leading distributors and value-added resellers, as well as from Dell, HP, IBM and Lenovo. Solarflare is headquartered in Irvine, California, and operates R&D facilities in Cambridge, UK, San Diego, USA and New Delhi, India. For more information, please visit www.solarflare.com. About this company Solarflare Communications, Inc.